Vanderwolf Pine This tree is an ‘Idaho Preferred’ Plant. 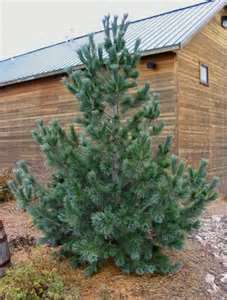 Vanderwolf Pine is also known as the Rocky Mountain White Pine. It is a slender tree growing only about 15' wide at maturity. It will grow from 20' to 25' in height. The needles are long, soft, and bluish-green. It is drought tolerant once it is established. Use this tree as a windbreak, or a specimen. Vanderwolf Pine also attracts bees and is deer resistant. Vanderwolf Pine likes to be planted in full sun.